Welcome everyone to the April Tour de Freaks Blog Hop! We are so happy that you are joining us! The month our theme is masculine or ‘gender neutral’…I decided to go with the ‘gender neutral’ one! If you are going forward through the blog, you arrived here from Wendy Weixler’s Wickedly Wonderful Blog! She always has the most AMAZING things! For my projects I decided to focus on using the Retro Fresh dsp. We have several dsp’s right now that says ‘gender neutral to me. This layout might look familiar to the other freaks as I used this card but with different dsp for my last Control Freak swap! This really really quite fun (and easy) The base if Coastal Cabana, Take a piece of Very Vanilla and lay 4 different dsp prints (7/8″ each) on it. Cut out the Starburst Framelit. Wrap some Pumpkin Pie 1/8″ Taffeta ribbon around it. Stamp Oh Happy Day on another piece of Very Vanilla layer behind the opening using dimensionals then add to card front using dimensionals along the top and bottom. Oh…but you have this WONDERFUL circle that you cut out from this card….you can’t let it go to waste! Yep…that circle works perfectly on my second card. Again the base if Coastal Cabana. I took another strip of the Coastal Cabana and ran it through my Arrows Textured Embossing Folder and added it to the card front then added my cool leftover circle. Next I made my tag, stamped the star in So Saffron and the greeting in Tangerine Tango, Soft Suede, and Coastal Cabana, added a strip of dsp to the bottom, Soft Suede 3/8″ Taffeta Ribbon to the top tied with Linen Thread. The tag is added using dimensionals. 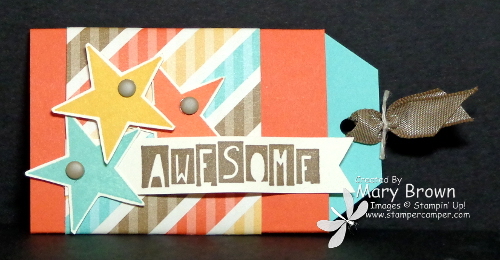 I stamped the celebrate in Soft Suede on So Saffron, cut out with the Starburst Framelit and added it to the card to finish it off. Okay…time for the my last item…a little money holder. No matter WHAT gender you are…money works! This is a quick and easy money holder. Now because gift cards are just a smidge bigger than 2″…I went with money instead of gift card so it would work with my Tag Topper punch. Went with this one so that it again was more ‘gender neutral’ then the scallop one would be! I hope you enjoyed my projects and are inspired to do some fun things with the Retro Fresh dsp! Now it’s time to hop on over to Judy DiScipio at Judy Stamps blog and check out the GREAT projects she has for you! This entry was posted in 3D, Spring Mini, Tour de Freaks and tagged Cool Kid, Perfect Pennants, Starburst Sayings. Bookmark the permalink. 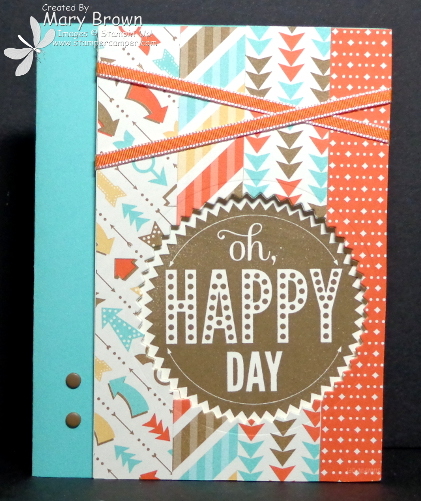 Love how you used the strips of DSP into all of your projects and how everything coordinates so perfectly. The money holder is adorable! 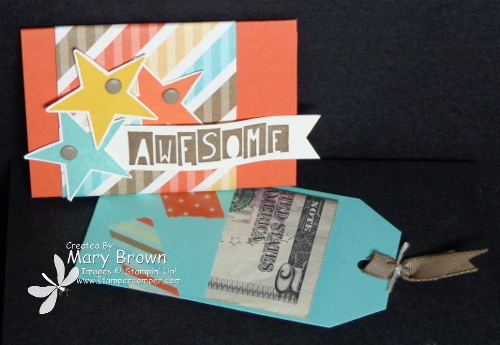 Very fun cards…love the “Awesome” money holder! All are fun …. nicely done!